Furnish ____Rockford Model OS-____all-welded ____1/4" steel separators, ____ g.p.m. intermittent flow, ____" (tapped) (hubbed) inlet and outlet, ____" tapped internal vent connection, ____" tapped oil draw-off connection for adjustable oil draw-off, visible double-wall outside trap seal, non-removable separator screen with easily removable filter screen, removable 3/8" nonskid diamond treadplate cover(s) for flush-with-floor installation for pedestrian traffic, or reinforced for ____(light)(heavy) traffic, cover(s) secured with stainless steel flat head screws, extra-heavy leakproof gasket. OPEX® Shop Coat coating (resistant to oil, grease and cutting oils) inside and bituminous coating outside. Anchor flange, filter media, sediment basket, integral extension, epoxy coating, anodes, coalescing pack. Double-wall construction. 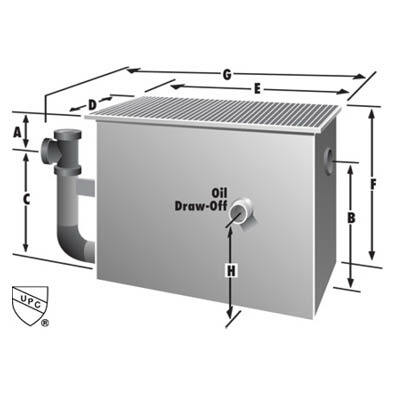 For uses requiring the retention and safe disposal of oil and other volatile liquids. Recommended Top Access to be able to observe and clean the entire fluid surface in all chambers down to the bottom of the unit.